Make-up artists are fixtures on movie and TV shoots. In this month’s issue, you’ll learn about the crucial role they also play in legacy video productions. 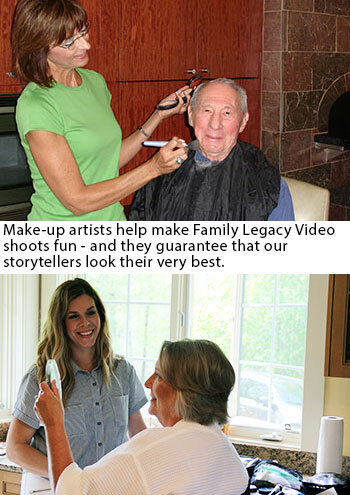 One thing family storytellers can count on when they appear in a legacy video produced by Family Legacy Video® is that they’ll look and sound their very best on-screen. There are a lot of technical ways Family Legacy Video® crews guarantee this, among them using great cameras and lenses, employing creative and flattering lighting techniques, as well as using high-quality, strategically placed microphones. But there’s another ingredient that’s indispensable to a successful video biography interview: make-up. If you’ve been watching Saturday Night Live as many years as I have, you may remember Billy Crystal’s Fernando Lamas impersonation. Fernando’s ultimate compliment was, “You look marvelous!” But he also used to say, “It’s not how you feel, it’s how you look!” I have to disagree with Fernando on that count. In my experience, how you look, and knowing you “look marvelous,” has a big impact on how you feel when you sit for a Family Legacy Video® interview. That’s why a make-up artist almost always has a place on one of our legacy video crews. As I mentioned above, here’s where I part company with Fernando. Knowing I’m looking great always lifts my spirits and boosts my confidence, which helps me perform at my best. I see this effect time after time with the storytellers I interview. Knowing how to make you appear as the best version of yourself while you’re in front of a video camera is truly an art. This is where the make-up artist comes into play. And the process has as great an influence on a storyteller’s state of mind as does the end result. Make-up artists are “people” people. Their only concern is making sure you’re happy with the way you look – and while they work with you they’ll chat you up, make you feel at ease, and together you’ll have fun! (Yes – even you guys!) I always enjoy seeing a storyteller step onto the set, looking great and just glowing with satisfaction at the way he/she looks. The make-up artist’s job doesn’t end there, either. She’ll stick around during the interview, and do whatever touch-ups are needed during recording breaks. You’ll end up looking terrific from start to finish.